Mobile gaming is growing at a rate of knots. Every day consumers continue to download games to their phones, with millions of people across the globe experiencing the thrill of gaming on their smartphones. 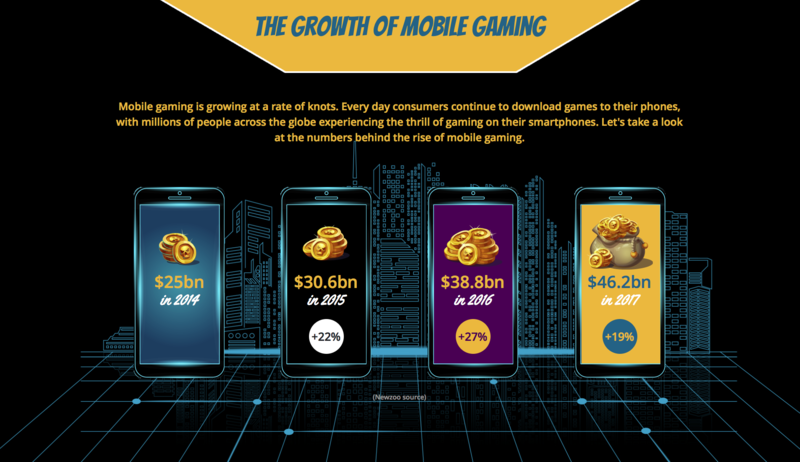 Let’s take a look at the numbers behind the rise of mobile gaming. As growth in mobile device ownership balloons, so does the rise in smartphone and tablet gaming. In fact, mobile devices are now being deemed as the top consumer gaming platform, defeating even the PC and dedicated consoles. In research conducted between 2014 and 2017, growth in the number of users for smartphones sky-rocketed compared to the stable usage of PCs and consoles combined. Growth in revenue for mobile devices rose from $25 billion to $45 billion in 2017. Mobile gaming also opened up an avenue for female gamers to explore. A gamer study in 2017, as featured in this infographic, showed an almost equal mobile gaming usage of female and male players. In fact, in North America with 146 million mobile gamers, 48% were reported to be female gamers versus 52% male players.